The Russian Orthodox Church has decided to end its relationship with the Ecumenical Patriarchate of Constantinople in protest over its endorsement of Ukraine's request for an autocephalous, or independent, church. Metropolitan Ilarion, the head of external relations for the Russian Orthodox Church, made the announcement on October 15 following a meeting of the church's leaders in Belarus's capital, Minsk. The Holy Synod was called by Moscow Patriarch Kirill, the head of the Russian Orthodox Church, after the Ecumenical Patriarch Bartholomew of Constantinople, who is considered the leader of the worldwide Orthodox community, on October 11 agreed to recognize the independence of the Ukrainian Orthodox Church. Ilarion told journalists that the synod -- the Russian Orthodox Church's decision-making body -- was left with no choice but to sever ties with the patriarchate based in Istanbul. 'A decision has been made to rupture full communion with the Constantinople Patriarchate,' he said, meaning that priests from the two churches cannot serve together while worshippers of one cannot take communion in the other. 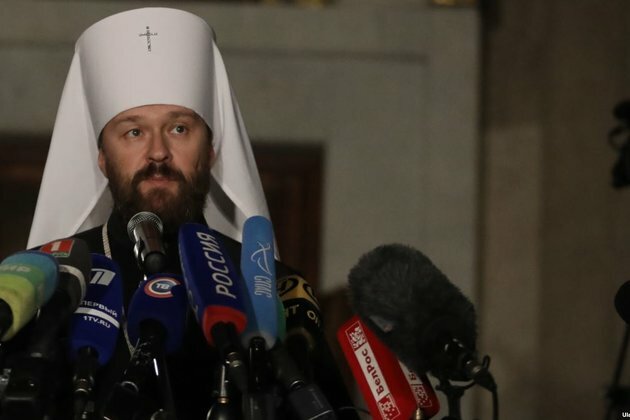 Ilarion said that Constantinople's decision to back what the Russian Orthodox Church considers a schismatic church is 'illegal and canonically worthless,' and effectively drives it into a schism. 'A schism is always bad, it means negative consequences, and that's the most dangerous thing,' Lukashenka was quoted as saying. The Belarusian Orthodox Church, which is by far the biggest religious denomination in the nation of nearly 10 million, is under the direct jurisdiction of the Russian Orthodox Church. Russian President Vladimir Putin's Security Council discussed the issue of the church in Ukraine at a meeting late on October 12, the Kremlin said. Putin's spokesman, Dmitry Peskov, said earlier that day that Russia will protect the interests of the faithful in Ukraine if the historic split leads to illegal action or violence. He promised that it would use 'exclusively political and diplomatic' means to do so. Meanwhile, in Kyiv, on October 14, thousands of people gathered on a central square to take part in a thanksgiving prayer following the decision by Bartholomew to kick off the process of granting independence to the Ukrainian Orthodox Church.